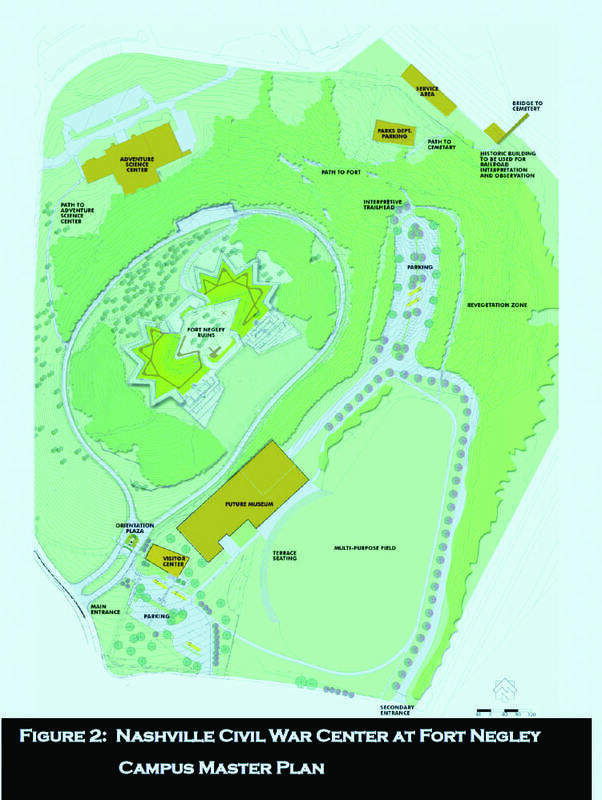 Illustration of Fort Negley Park from the 1996 Master Plan, revised in 2007. NASHVILLE, TN — Metro’s procurement office recently approved a plan to build 405 apartments, two office buildings, retail stores, and an early childhood education center in Fort Negley Park where at least 600 African Americans died during the Civil War. Runaway slaves built Fort Negley in 1862 and some of their descendants want the city to shelve its plans to develop Greer Stadium. A formal protest has been filed with the city’s Finance Department to get city officials to rethink the whole idea. “If it can happen here it can happen at other metro parks,” says Gary Burke, a descendant of Peter Bailey, one of the “colored” soldiers stationed at Fort Negley during the Civil War. Burke is a board member of the Friends of Fort Negley. Molly Miller is also on the Friends of Fort Negley board. “It seems so clear to me that we need to preserve the integrity of the park. Why would we give away a park in a place where we need it the most?” she asks. The 2007 supplement to the 1996 Fort Negley Master Plan calls for re-integrating Greer Stadium into the Fort Negley Park after the Sounds’ lease expired. But that is not what is happening. According to District 17 Councilman Colby Sledge, the redevelopment of the site grew out of two community meetings. Ideas were solicited from the public and the Procurement Department prepared a Request for Quote (RFQ). The RFQ was called “Rehabilitation and Lease of Greer Stadium Property”. Critics say it’s a backdoor scheme to open the park to development. “It’s a gold mine and they know it,” said Dr. Bobby Lovett, an historian who used to take his TSU students to inspect the limestone walls of Fort Negley to give them a firsthand experience with their own history. “It would be like building housing in the middle of Central Park or in the middle of Hadley Park and I think that is unacceptable. It’s pretense to lease or sell the peoples’ land to a private group of people who can really do what they wish to do with it,” said Lovett. On the open market 20 acres of undeveloped prime real estate with spectacular views of downtown would be worth at least $200 million. In other words, proposals that would actually rehab the stadium and use it for sports and recreation would not qualify. Nashville’s Parks and Recreation Commission paid $20,000 to a granddaughter of John Overton for the old fort and its surrounding acreage to build a city park in 1928. A dozen proposals were submitted. There were five finalists but only two were asked to give presentations to the seven members of the selection committee. Devinder Sandhu was a principal architect of the proposal by Nashville Adventure Park Inc. that would have turned Greer Stadium into an indoor venue for soccer, rugby, and other sports. Sandhu wanted to tear down all the fences, tear up the paved parking lots, and let everything else go back to the park it once was. But parks and playing fields are publicly supported and embedded in the RFQ was the requirement to generate income from the land. “We were being thrown into a mix with other developers so we had to come up with a plan that would pay for it,” Sandhu said. So his group added two hotels, three buildings of workforce housing, and some senior housing to their proposal. The judges wrote that the plan, which scored 70, “fell short of expectations. Packed a lot of things into the site but didn’t support how those were to be achieved”. The winning proposal by The Mathews Company scored 96 out of 100. The evaluation panel found it noteworthy for having discussions with Vanderbilt University, plenty of endorsements, and because it “appears to be fully funded”. “We had to develop it as developers instead of preservationists,” said Sandhu. “That’s loading the dice,” he added. Sandhu filed a protest with Procurement Appeals Board. The protest hearing is scheduled for June 22. NASHVILLE, TN — Between 1935-41 the Works Progress Administration (WPA) rebuilt limestone walls, graded the land below Fort Negley and built softball fields, stone bleachers, and a hardball field. The Sounds leased the ball fields, built Greer Stadium, and played there from 1978-2014. In March, the Finance Department invited bids to lease and develop about one-third of the old Overton property that includes the Adventure Science Museum, Fort Negley, and Greer Stadium. The Procurement Department accepted The Mathews Group’s plan to redevelop Greer Stadium on May 26 and contract negotiations are underway. The city council must approve the deal. One archeologist from MTSU thinks any redevelopment scheme that builds on top of Fort Negley will destroy the historical record that still lies buried there. I don’t know how well they did it 150 years ago,” said Professor Zada Law. About one quarter of 2,500 African Americans who constructed the fort died from cholera, malaria, small pox, typhoid, and pneumonia in the winter of 1862. They were buried quickly and later their bodies were exhumed and reburied in the Nashville city cemetery. But Law says some union soldiers and runaway slaves are probably still buried underneath Greer Stadium’s right field and front parking lot, just a stone’s throw from the Fort Negley visitors center. Law says there is an African American Atlantis buried on the 50 acres surrounding Fort Negley. The runaway slaves who were conscripted by the Union Army to build the fort slept out in the open. Later they got tents and some built shanties in what were called contraband camps next to the fort. Law says those camps became the center of an African American neighborhood that spread out from Fort Negley and the lot lines that match up to the lots shown on maps from the late 19th Century are still visible. Law said Nashville is the epicenter of the civil rights movement and Fort Negley is where that story began. “Former enslaved human beings fleeing to the Union forces, it’s a fraught story. At Fort Negley we have a place to tell that story,” she said.